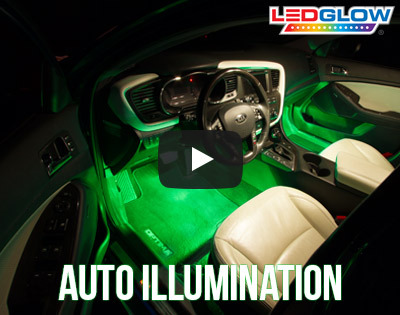 LEDGlow’s 4pc Green LED Interior Car Lights features (4) 9” tubes with 18 ultra-bright LEDs per tube that create multiple unique green lighting effects for your vehicle's interior. 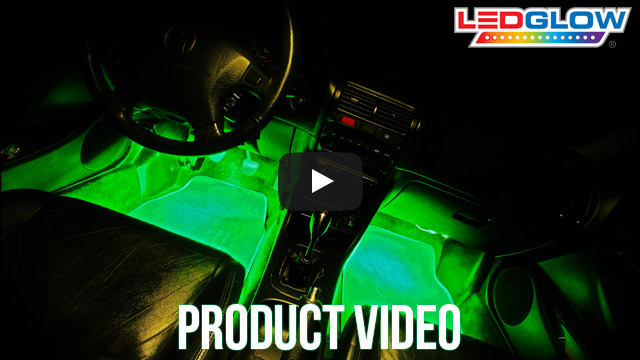 LEDGlow’s 4pc Green Interior Kit features multiple lighting effects, and instantly adds a green illumination to your vehicle’s interior giving a distinct, custom style. This LED interior light kit features a total of 72 ultra-bright, wide angle green LEDs housed in (4) 9" tubes. Each LED interior tube features 5' of power wire and is easily mounted under your seats, dashboard, or foot wells using the included zip ties and/or mounting screws. The easy to use control box offers multiple solid color modes, 3 strobing modes, 3 fading modes, 1 scan mode, as well as 1 sound activation mode. The included sound activation mode allows this interior lighting kit to react to the beat of the music playing inside of your vehicle with a built in microphone, and the sensitivity is easily adjusted with a wheel that is located on the side of the control box. Out of the box, with 4.5’ of power wire and a pre-wired 5 amp inline fuse, this kit can be powered directly from the vehicle’s battery. For simpler installation that doesn’t require the splicing of wire or access to the battery, other power options are available. 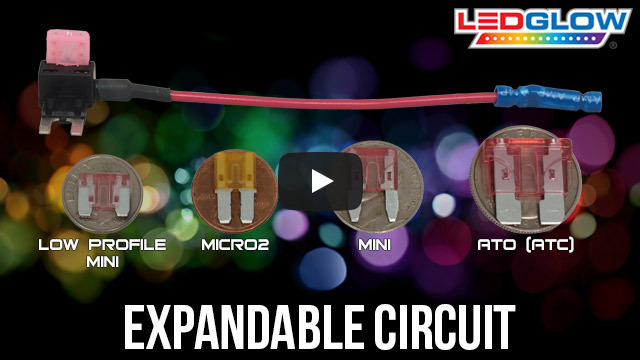 LEDGlow's Expandable Circuit will power any lighting kit directly from the fuse box. The Cigarette Lighter Power Adapter will easily power any LED light kit directly from the vehicle’s cigarette lighter receptacle. As long as a 12 volt source of power is available into which the kit can be wired, additional power options are available, allowing for extreme customization in any vehicle. Using the auto illumination bypass mode, this kit can be set to illuminate when a door is opened, when the headlights are turned on, or when the ignition is engaged. 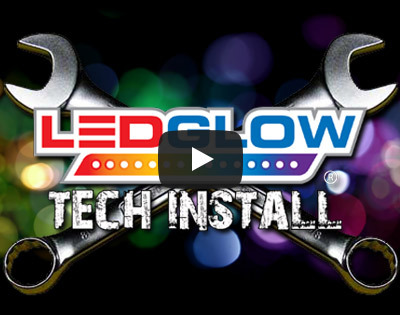 LEDGlow stands by every one of its products with a one-year limited warranty and free lifetime technical support. WOW is all I can say!! The 4pc green interior LED"S are absolutely amazing!! I have the green wireless remote neon under my truck and it turns head since i drive a lowered Chevy Colorado with bags!! And now with this green interior LED'S it deff turns heads and for such a cheap price its a win win guys!!! I just installed the kit today and it took about 2 hours. It probably will take most people half the time, the wiring was a bit tricky since I drive a 1960 Thunderbird. somthing you will probably need is extra 16 gauge wire and possibly a toggle swith. When the lights were installed they looked great! Bright enough so that it looked cool but not too bright so it would be blinding. For the price and quality, I would definitly suggest it!